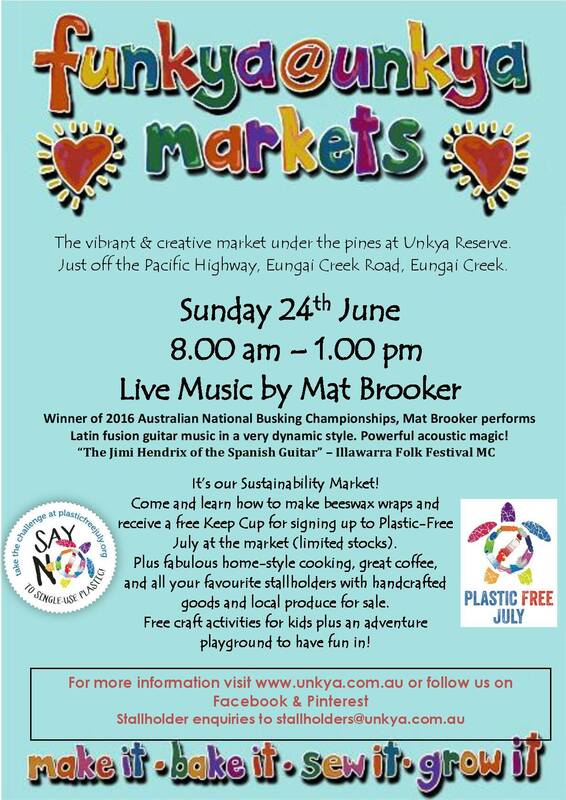 Our June market will be on Sunday 24 June at Unkya Reserve, Eungai Creek Road, Eungai Creek from 8am to 1pm. We’re celebrating sustainability by being a plastic bag free market, not selling bottled water and not using plastic straws. Come along for demos and workshops – learn how to make crafts out of recycled materials and make your own beeswax wrap. And the first 50 people who sign up to Plastic Free July at the market, you will receive a free Keep Cup. Listen to the sounds of Mat Brooker – Winner of the 2016 Australian National Busking Championships, Mat Brooker will take you on a global journey of sounds. Using acoustic guitar, voice and some live looping, Mat weaves his way through flamenco, blues, middle eastern sounds and more. Plus all our great stallholders, excellent coffee and home baked goods, free craft for the kids and great fun for all.